A view of the JUICE Thermal Development Model (TDM) inside the Large Space Simulator at ESA's European Space Research & Technology Centre (ESTEC). 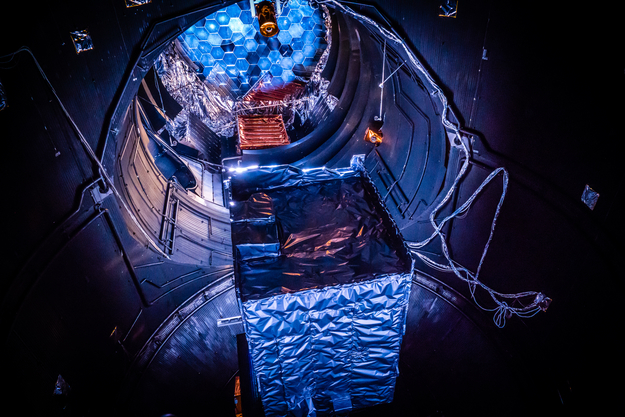 In order to ensure that the spacecraft will survive the extreme temperature variations it will experience in deep space, TDM completed a thermal verification test during May 2018. High-energy lamps and mirrors of the Sun Simulator were used to heat the Sun-facing side of the TDM to around 200 degrees Celsius, while the internal temperature of the vacuum chamber was lowered to -180 degrees Celsius by thermal shrouds filled with liquid nitrogen.